CMA KickStart Artists. Pictured (L-R): Travis Denning, Kassi Ashton and Jameson Rodgers. 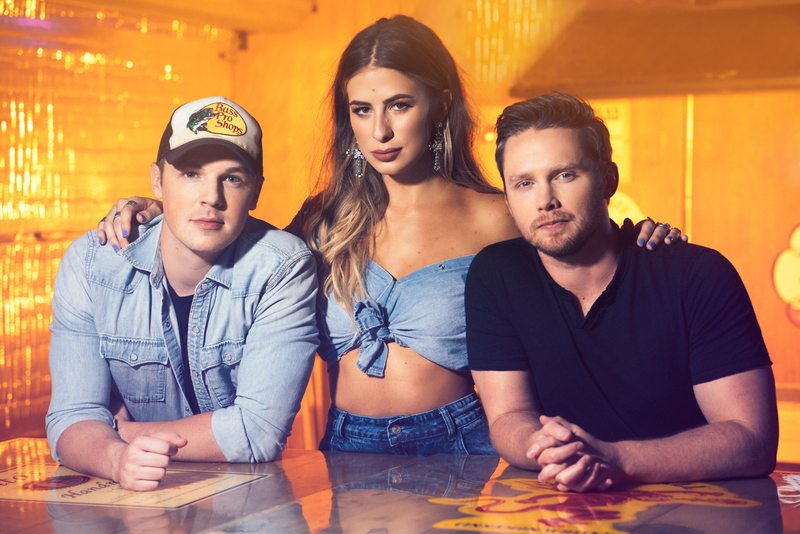 The Country Music Association (CMA) has selected rising stars Kassi Ashton, Travis Denning and Jameson Rodgers as recipients of the first-ever CMA KixStart Artist Scholarship. Throughout the next year, CMA and its staff will provide support for the three artists, helping connect each with professionals within the industry as well as providing unique opportunities to participate in CMA-related events during CMA Fest, CMA Awards and C2C: Country 2 Country festival in the U.K.
“The CMA board is continually looking for ways to grow our format and help support our artist community. The idea behind KixStart was to focus on emerging artists who are already out there working hard but could use a boost that these extra resources might provide. And I think we found out from the high number of artists who applied for the scholarship program that CMA has identified a real need,” said Harrington. On Tuesday evening (Oct. 16), Denning and Rodgers performed for CMA board members during a private dinner held at BMI, while Ashton is currently overseas, participating in the CMA Songwriters Series U.K. tour. Ashton, who is signed to UMG Nashville in conjunction with Interscope Records, released her auto-biographical song “California, Missouri,” where she paints an unconventional portrait of life growing up in her small town. She followed it up with her latest single, “Taxidermy.” Keith Urban featured Ashton on his song “Drop Top” for his latest album Graffiti U.
Mercury Nashville’s Travis Denning moved to Nashville in 2014 and within a year signed a publishing deal with Jeremy Stover’s RED Creative Group. After securing outside cuts by Jason Aldean, Justin Moore, Michael Ray and Chase Rice he caught the attention of Universal Music Group where he signed a record deal in 2017. Denning just released his debut single “David Ashley Parker From Powder Springs,” an upbeat coming-of-age song that paints a picture of a young man reminiscing on his carefree college memories. The singer/songwriter has previously opened shows for Cole Swindell, Alan Jackson, Moore and Rice and is set to hit the road with LANCO on the “Hallelujah Nights” tour this fall. When Denning is not touring, the Georgia native is in the studio working on his debut album. Batesville, Mississippi, singer-songwriter Rodgers released his new self-titled EP in January 2018. This year, Rodgers also received the AIMP (Association of Independent Music Publishers) Nashville Rising Artist-Writer of the Year nomination for the third annual awards show. The former college baseball player, who landed a publishing deal with Combustion Music in 2014, scored his first songwriting cuts with Florida Georgia Line’s “Wish You Were On It” and “Talk You Out Of It” in addition to co-writing Chris Lane’s new single “I Don’t Know About You.” His debut EP, released in 2016, features the streaming hit “Midnight Daydream.” In addition to opening shows for Sam Hunt and Old Dominion, Rodgers has been selling out clubs throughout the south and Midwest this year. He will join Luke Combs’ “Beer Never Broke My Heart Tour,” kicking off in January.